The 2019 Archery Trade Association trade show just wrapped up and the aisles were full of optimism and excitement at some of the new products being introduced at this year’s show. The ATA show is not open to the public. It is a show designed for retailers, buyers and media to see all of the new products and to place orders for these products. It is also a chance for media, like me, to see, feel and test new innovative products that are being introduced. This gives people like me the chance to tell you about what is coming in 2019 and what is exciting in the industry. At this year’s ATA there were some products that stood out, and we will look at just a few here, but not in any specific order. The crossbow industry has made giant leaps forward in recent years. Many companies are pushing the limits of what these bows can do. And just when you think they have maxed out crossbow capabilities, they come up with something else. TenPoint, long a leader in the crossbow market, developed the reverse-draw crossbow several years ago. An odd looking concept, the reverse draw enables the bow to have a much longer power stroke allowing the arrow to be attached to the bow string longer and thereby, generating a lot more speed and energy. The new Nitro XRT has delivered in spades! This crossbow is pushing arrows at a blistering 470 fps! In a hunting setup with 125 grain broadheads and heavier arrows, it is still at 428 fps. (Different set up configurations will impact this number, but it is still fast.) The Nitro XRT has the majority of the weight of the crossbow in the center of the stock rather than forward as in a traditional crossbow. This enables steadier aiming. The Nitro is a tad heavy, coming in at 7.8 pounds with the EVO X Marksman scope attached. It comes standard with the AccuDraw Pro silent crank draw device. Perhaps the best improvement for all of the TenPoint lineup is the new T5 trigger that is standard on all of their crossbows in 2019. This is without question the finest trigger in the industry. It is crisp and set at a factory 3 lbs. which is perfect for accurate shots. MSRP: $2,499 Complete with case, arrows and EXO X Marksman scope. The designers at Sitka Gear are not sitting on their laurels – not by any stretch. In addition to advancing hunting gear, a new line of lifestyle clothing is hitting the market. One set of clothing that caught my eye was their “Hanger Henley shirt and Hanger pant,” so named for the specific reason it was designed. This line is aimed at the early season when temperatures are extreme is when many whitetail hunters are hanging tree stands. The Hanger Henley shirt and pant are designed for that purpose. Loaded with the Polygiene Odor® control and an insect shield to ward off ticks, the lightweight Poly/Spandex blend wicks away sweat while keeping you comfortable. The Henley comes with a 3-button design to allow ventilation. 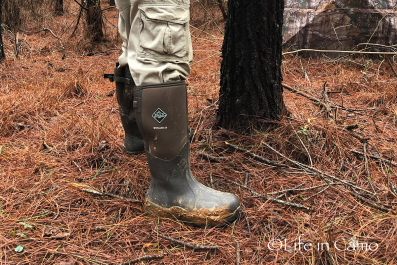 While the pants are lightweight and durable, the abrasion-resistant Cordura® front panels ward off briars and the insect shield helps to keep other unwanted visitors away. One aspect of the Hanger system that stood out was how Sitka didn’t miss a detail. Perfectly placed pockets stretch in just the right places – everything needed for those early season chores. In the world of hunting packs, few rival the innovation and durability of ALPS. Everything from large backcountry packs to camera packs, they have it all. For 2019, they have done it again with the introduction of the Contender Pack. Designed for the blind or treestand, it comes only in the new Veil Camo Whitetail pattern. This pack has a generous main compartment that is easily accessed with a dual access pocket for small items and generous belt pockets that easily hold headlamps, rangefinders or wind testers. One key feature of the Contender X is the “L-Shaped” frame. This pack will stand up on its own! Perfect for the ground blind, it stays where it is put. Summit, long a leader in treestands, has issued for 2019 a line of ground blinds that will rival all others available. Summit decided to enter the ground blind market with a bang, introducing four distinct blinds for every need and level. The Vital, Cobra, Viper and Goliath ground blinds offer everything you need for ground hunting. Whether you are chasing old tom, a screaming bull, or bears of the north, Summit has you covered. I personally really like the Viper with its spacious size, and it is the flagship of the Summit blind series. The four-person model is available in either Realtree Edge or Veil Whitetail patterns. It comes in at 21 pounds, but the interior height of 74 inches and a shooting width of 82 inches with a footprint of 66×66 inches make it one of the biggest and roomiest of all ground blinds available today. The silent slide mesh windows provide excellent visibility and a moveable curtain allows you to block out areas you want for backdrop. A key feature of the Summit Ground blinds are the “Hush-Silent Hatch-hinged door system.” This door swings open and closes silently. No more loud zippers to close the door when you are hunting. A full zipper is available to close it off when leaving. The generous door allows easy entry while carrying a backpack. The series of ground blinds from Summit has different price points for your needs. The 2-person Vital starts at $139 and the 4-person Viper come with a MSRP of $329 respectfully. I have to admit, this item is not new to 2019, but it was the first time I personally saw it, and I was impressed. 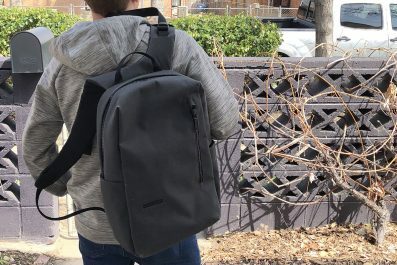 The Panga Backpack is not just a backpack. 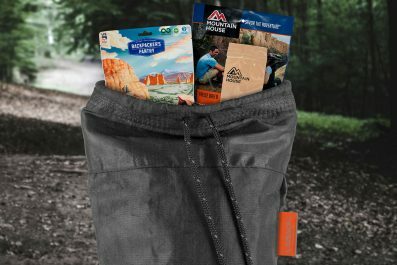 This pack is completely air and water tight! The designers at Yeti took the durability and design of the Panga duffel and merged it with the backpack design to create the Panga Backpack. Rafters, wading anglers, and surf anglers never need to worry about their items getting wet or even damp again. Dry sacks are a thing of the past with the Panga Backpack! I can see many uses for this pack – in the floor of the canoe, on float planes, bow fishing, surf fishing and more. The Panga Backpack is a must have for any outdoor-minded person who does not run with the threat of rain. The state of the archery and hunting industry is strong, and the attendance of the ATA demonstrated a positive future. If anything came from the event, it is that more than anything else, hunters need to stick together and move forward as one unit. More about that shortly. In the meantime, get out there and enjoy the passion.